International master Maxim Notkin comments some games of his September collection. Our columnist IM Maxim Notkin presents the results of experts' voting for the best game played in September 2007.
International master Maxim Notkin comments some games of his collection of the best games played in August 2007. Our columnist IM Maxim Notkin presents the results of experts' voting for the best game played in August 2007. M Maxim Notkin presents his collection of the best games played in August. Our columnist Maxim Notkin comments some games of his collection of the best games played in July 2007. IM Maxim Notkin presents results of the experts' voting for the best games played in July 2007. M Maxim Notkin presents his collection of the best games played in July. Our columnist IM Maxim Notkin comments some of the best games played in June. Our columnist IM Maxim Notkin presents results of experts' voting for the best game played in June. IM Maxim Notkin comments some of the best games played in May. Our columnist IM Maxim Notkin presents results of experts' voting for the best game played in May. A review of the best games played in April is prepared by our columnist IM Maxim Notkin. Our columnist IM Maxim Notkin presents results of experts' voting for the best game played in April. IM Maxim Notkin sums up expert voting for the best game played in 2006. Also, top three games are commented. IM Maxim Notkin offers to evaluate best games played in April. International master Maxim Notkin concludes the expert voting for the best game of march. IM Maxim Notkin offers to evaluate best games played in March. A review of the best games played in February is prepared by the host of the section IM Maksim Notkin. International master Maxim Notkin concludes the expert voting for the best game of January. The columnist IM Maxim Notkin presents 14 best creative achievements of November to the experts and readers’ estimate. International master Maxim Notkin concludes the expert voting for the best game of August.. It is not easy to classify the Topalov-Kramnik match. Is it a world championship match? But such tag is usually associated with a match between the champion and the contender, who qualified (ideally) through the championship cycle. Hot guys fought hard in the heat of July. And, to be accurate and consistent, hot girls fought, too. Some experts noted that the selection is generally not very impressive, but I will try to annotate it to reverse that impression. There is something curious in each of the encounters above. International master Maxim Notkin concludes the expert voting for the best game of July. International master Maxim NOTKIN comments selected games played in June. Maxim NOTKIN concludes the June best game voting. As usual, my review features games that are not very well known to the Russian-speaking reader. Strangely, the encounter Morozevich-Moiseenko, which won our April contest, also falls under this category. As far as I concerned, it hasn`t been deeply analyzed neither in chess magazines and newspapers nor on the Internet. However, I consider it wrong placing the masterpiece among lighter works. Maybe one of our experts will take the responsibility of discovering all the subtleties of that game. And so far I am pleased to present you a mixture of foreign melodies. The voting for the best game of the year 2005 by the e3e5 website version is now concluded. We nominated the games that had taken top three positions is our monthly lists. Some experts decided to mention other games, which in their opinion deserved being included in top 36 at least, for instance, Ponomariov’s win over Topalov in Sofia or a glorious draw Anand-Topalov from the same tournament. Maybe we will change the regulations in future, although each of the nominated games entered the top 10 of at least one expert. International Master Maxim Notkin concludes the March best games voting. International Master Maxim Notkin concludes the expert voting in February. International Master Maxim Notkin reviews the best games played in January. For a second year in a row I realize that carrying out a January best game contest is not an easy task. In February most regular members of our expert committee participate in the Aeroflot open, then travel to Cappelle la Grande, and so on. I did not want to disturb participants of the coming Women’s World Championship on such an unimportant although pleasing occasion, too. Finally, my call was heard by Evgeny Gleizerov, Alexander Motylev, Emil Sutovsky, Mikhail Kobalia, Evgeny Najer, Sergey Soloviov, Ilya Odessky and Vladimir Barsky. Legitimacy of voting of this jury is doubtless. Alexandra Kosteniuk, Evgeny Gleizerov, Mikhail Kobalia, Emil Sutovsky, Sergei Soloviov, Ilya Odessky and also Sergei Ivanov and Sergei Klimov, whose eloquence will relieve me of the duty of presenting encounters-nominees by myself, participated in the summing up the last month of the passed year’s results. Maxim Notkin sums up the results of expert voting in October. Maxim Notkin sums up the results of Sempember voting. Added to the "Creativity" section. The report with annotated games to follow shortly. Maxim Notkin concludes his world championship column by providing a sketchy outline for the future. 14th issue of Maxim Notkin's "Pearl of the Day"
Our tired columnist analyzes the critical part of the penultimate round draw between Anand and Morozevich. Maxim Notkin features the 12th round game Leko-Anand. Added to the "Competitions" section. Maxim Notkin writes about two games of the 11th round: Adams-Topalov (briefly) and Anand-Kasimdzhanov (in detail). Read in the "Competitions" section. The Sicilian encounter Kasimdzhanov-Polgar is analyzed in the 10th issue of "Pearl of the Day. The 9th issue of "Pear of the Day" features a marvellous game played between Svidler and Kasimdzhanov. IM Maxim Notkin presents the Adams-Svidler and Kasimdzhanov-Morozevich games. Maxim Notkin returns to Anand's spectacular opening win against Adams, and analyzes the critical position in detail. IM Maxim Notkin writes about Rustam Kasimdzhanov's sensational victory over Vishy Anand. The third issue of Maxim Notkin's "Pearl of the day" features Polgar-Kasimdzhanov game. The second issue of Maxim Notkin's "Pearl of the day" features Topalov-Anand - the longest game of the second round. Added to the "Competitions" section. The first issue of IM Maxim Notkin's column "Pearl of the day"
The games considered here were played by 12 chess players from 11 countries in 6 different places on our glorious planet, which is teared apart by political, national, ecological and interpersonal contradictions. Beauty will save the world. Amen! The review begins. Consideration and rating of the games of July was done with the help of Alexandra Kosteniuk, Evgeniy Najer, Alexei Bezgodov, Sergey Soloviov, Ilya Odessky, Vladimir Barsky and also Sergey Ivanov and Nikita Vitiugov, whose eloquence I will rest on frequently and with pleasure in suming up. IM Maxim Notkin annotates the best games of June. IM Maxim Notkin makes the survey on the best games played in May. IM Maxim Notkin reviews the best games that were played in the chess world and appraised by experts in May 2005. IM Maxim Notkin reviews the best games that were played in the chess world and appraised by experts in April 2005. Until the end of May you will read an analysis of the best masterpieces and a detailed survey of all candidate encounters of the month. IM Maxim Notkin reviews the best games of March. 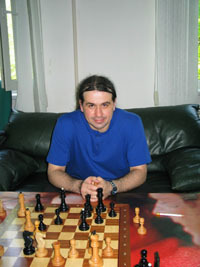 The international master Maxim Notkin sums up the results of experts’ voting in defining the best games that were played in the chess world during the March of 2005. Till the end of April visitors will have an opportunity to read the survey of all the candidate games of this month. IM Maxim Notkin concludes the expert voting for the best games of February. IM Maxim Notkin sums up the results of the experts' polling for the purpose to determine the best games, played in the chess world in January 2005. Until the end of February our readers will acquaint themselves with an analysis of the best works and also with a thorough review of all of the games-pretenders of the month. And already in the first ten days of March a new February list will be published and such a scheme will be held to constantly, every month. Procedures of selection of games that were described in my opening address are finished.With such tournaments as Wijk-aan-Zee one of the main difficulties is not to fall under the magic of names.